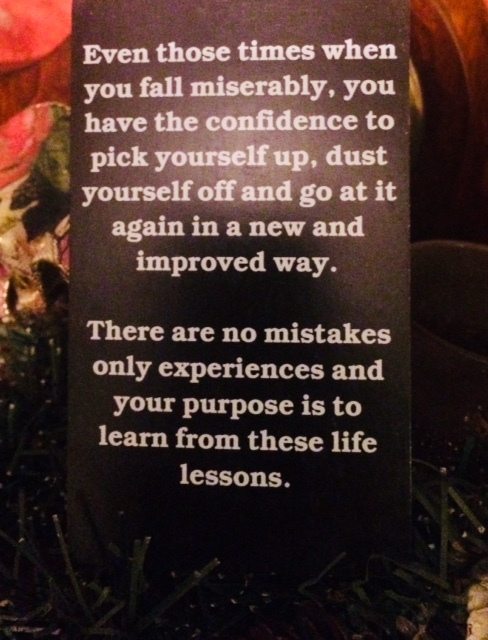 Here are a few messages for the New Year from the deck of Oracle Cards I designed, Make It Happen. We often will have obstacles blocking our progress. On closer inspection, we will find all too often these are things from our past that need to be met head on and dealt with. Forgiveness of others and even ourselves is usually the healing tool that will break down the barriers and allow us to freely and openly receive what we need to succeed. The almighty "fear of..." that we can either use to make us stronger or to hold us back from being all we can be. One of the biggest mistakes is to try and hide your fear, ignore it or give in to it thus allowing the fear to define who you are rather than learning from it. As with anything you wish to change in your life, you have to first own it. Demand it come forward for you to look at in your mind's eye and see it for what it really is. Where did it begin and why? Can you see ways to change it or do you need help? Let go of ego and get the help...you do not have to do this alone but only you can start and finish the process. Face your fear, actually thank it for the lesson it taught you - something positive - recognize that either because of it or despite it, you are here in this moment and are now taking ownership of the emotion attached to it. Cut the cord between you and the fear, releasing it from you. Now, breathe deeply and move forward....even one tiny step at a time. You can Make it Happen! What is the most important time in your life? Who is the most important person? What is the most important thing you can be doing? NOW is the only time you have to deal with so it is the most important time....the person with you right now is the only one you can interact with so THEY are the most important person....what you are doing right NOW is the most important thing you can be doing as you cannot change the past nor are you in the future yet. However, how you spend the present moment will define your reality, your future, your spiritual growth. Being aware that the present moment is what you have control over empowers you to take hold of your life and actually live it! Are you feeling you are not in a good place at this moment? Allow yourself to learn from it, release what does not serve you, gain strength and envision the next moment then grasp it! Did you have "one of those day"? Perhaps you felt like nothing was going right or things were more difficult than they should be. What if you were to look at today's events as lessons? What if all the bumps and what appeared to be road blocks were actually the Universe attempting to steer you in a better direction? What if you could take a deep breath, close your eyes and really feel the gift of life flowing through your veins? Well, you can! It is not about how many times you fall but all the times you find that inner strength to pull yourself back up and get back in the game. Sometimes, you may need to sit on the bench for a while to regroup and get a new strategy but ultimately you will get back at things again. Success will follow when you learn from your falls, what works and what doesn't and be okay with all of that. No mistakes, only lessons and yes some are much better than others but you are always the winner!